How Mars and the blue star Regulus will look at 5 a.m. on Sept. 25, 2015. Mars will team up with the blue-tinged star Regulus in a dazzling display early Friday morning. The two celestial objects form a striking "double star" about one-quarter of the way up in the eastern sky one hour before sunrise through the end of September. With the naked eye or (especially) binoculars, you can see the greatly contrasting colors of golden-orange Mars and slightly blue-tinged Regulus. In a small telescope, the planet looks like little more than a star itself. With a miniscule apparent diameter of 3.8 arc seconds, Mars appears hardly bigger than the far more distant Uranus. Best of all, the two brightest planets will flank Mars and Regulus. 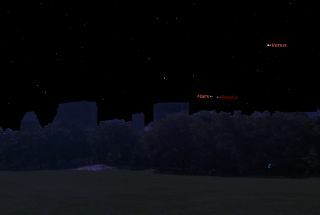 Situated well to their upper right is dazzling Venus, while dangling well to their lower left gleams brilliant Jupiter. Mars is continuing to approach Earth, slowly but surely. The Red Planet was behind the sun this summer, on the opposite side of the solar system from Earth. On June 14, for example, Mars was hidden from view and about 240 million miles (386 million kilometers) away. The planet remained pretty much at that distance through mid-July, then it began to move ever so slowly toward Earth while gradually freeing itself from the glare of the sun. Mars rose just over an hour before the sun at the start of August, but was rising 2 hours before dawn by the end of that month. The Red Planet appeared to gradually shift eastward against the zodiacal constellations throughout August, past the "twin stars" Pollux and Castor in the constellation Gemini, and then through the famous Beehive Star Cluster of Cancer, the Crab. On Sept. 5, Mars crossed over into the constellation Leo, the Lion. Because it's still very far from Earth, Mars remains unusually dim, shining at magnitude +1.8; it's currently placed in the ranking of a second-magnitude object and continues to remain at that level through this week. And yet, despite Mars' underperforming brightness, it will be interesting to watch the planet move through Leo's familiar sickle-and-triangle star pattern. Mars' movement is fast enough to be noticeable from day to day. On the morning of Oct. 9, Mars will form a triangle with Jupiter and a lovely waning crescent moon. Then, on Oct. 17, less than 0.5 degrees will separate Mars and Jupiter. Mars will continue to slide east through Leo. The triangle marking Leo's hindquarters provides another easy comparison point for judging the planet's movement against background stars. The second-magnitude star Denebola marks Leo's tail. Mars will pass well south of Denebola on Nov. 6. Then, just after autumn transitions into winter, on Dec. 23, the planet will pass 3.5 degrees north of the first-magnitude star Spica of Virgo. By next spring, Mars will approach Earth more closely than it has in more than a decade. On May 30, the Red Planet will be 46.77 million miles (75.26 million km) away and will be in the constellation of Libra, the Scales, shining at magnitude -2.0, some 32 times brighter than it appears now. Joe Rao serves as an instructor and guest lecturer at New York's Hayden Planetarium. He writes about astronomy for Natural History magazine, the Farmer's Almanac and other publications, and he is also an on-camera meteorologist for News 12 Westchester, N.Y. Follow us @Spacedotcom, Facebook or Google+. Originally published on Space.com.